Hannah Goldman, Daniella Seidl, Lea Kalisch, Luisa Muhr, and Laura Lassy Townsend. Photo by Emily Hewitt. “Between the Threads” was honest and unflinching from the pain and confusion the six women and a whole people have experienced. Yet, there was also an overarching sense of pride and solidarity in their identity as jewish woman. It was a solidarity and love that was felt throughout the whole theatre space. Despite the pain and confusion, they were proud of who they were and “Between the Threads” was a celebration of that. 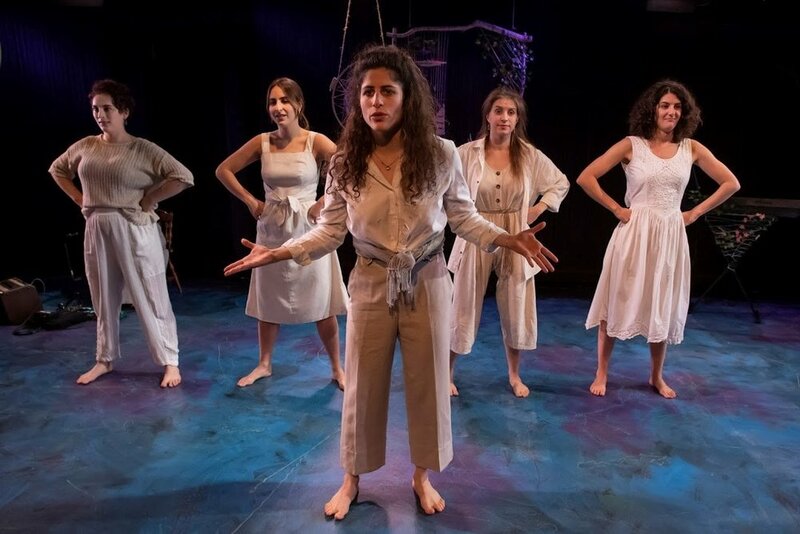 I believe much of the dialogue were actual stories compiled of the personal experiences of the six women on stage (if not, you had me convinced) and it really made the show feel that much more personal. We were able to connect to them because they were the stories of real people that we could bump into on the street next week, not just characters that would stay trapped within the walls of the theatre. It was all beautifully written, sometimes very raw, sometimes hopeful, even humorous. The six women were a perfect ensemble, working together seamlessly and almost as one being on the stage. The abstract movement and violin music added wonderfully to the piece. Often times, when we are feeling emotions too strong to put into words instrumental music and dance can pick up where words left off, and this was no exception. The two paired brilliantly with the stories, varying themselves in tone and emotion. One particular shoutout has to go to Elizabeth M. Stewart for the extremely striking lighting design, creating a really wonderful atmosphere that lent itself perfectly to the abstractness of the piece. Lauren Barber’s set design was also extremely well done. “Between the Threads” was a piece of theatre that truly used the form to its utmost potential. Being a story of solidarity between jews and jewish women specifically, a mirror onto an often cruel and unkind world, a call to action, and a celebration. It achieves this thorough sincere performances by a talented ensemble of actors that really believe in the story their telling. I look forward to seeing where “Between the Threads” goes next. It features set design by Lauren Barber, lighting design by Elizabeth M. Stewart, and costume design by Johanna Pan.